With a tone of command Peter said, "In the name of Jesus Christ of Nazareth rise up and walk!" UST OUTSIDE THE gate called Beautiful which led into the temple sat a poor cripple who had never walked a step. From his babyhood he had always been a cripple, unable to move himself about. Now he was a grown man, forty years old, and every morning his friends carried him to the place where he lay just outside the Beautiful gate. Because this poor man could not walk, he begged for a living. His friends carried him to the temple gate, where many people entered each day to pray. He believed that when these people saw him they would pity him and give him money. And they did. 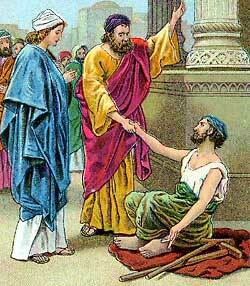 Seeing his pitiful condition, Peter said to the man, "Look on us!" But Peter said to him, "Silver and gold I do not have, but what I do have I give to you." Then with a tone of command he said: "In the name of Jesus Christ of Nazareth rise up and walk!" The happy man, wishing to express his great joy, then seized Peter and John, and while the three stood on Solomon's porch the astonished people gathered round to look on them. Seeing the people gather, Peter spoke to them and said, "Men of Israel, why do you wonder at this what had happened to the lame man? And why do you look so earnestly upon us, as though we by our own power or holiness made this man to walk?" "Even in the presence of Pilate, the Roman governor," said Peter, "you denied Jesus, when Pilate was determined to let him go. But you killed the Prince of life, this same Jesus whom God raised up from the dead, and of whom we are witnesses. And through faith in the name of Jesus this man who was always crippled now walks, and has perfect strength in the presence of you all." Peter, seeing their sorrow, said to them, "I know you did not realize what you were doing when you cried out in the mob to crucify the Lord of glory, neither did your rulers know; but God had showed by the prophets' writings how these very things would happen to his Son. And now, if you will repent of your sins, they will be blotted out. God will forgive them and you will be free from their guilt." "This teaching must be stopped!" they cried, and in a little while they returned to take Peter and John off to prison. On the next day these angered rulers brought their prisoners before the same wicked men who had tried Jesus, and these wicked men questioned Peter and John. First they asked, "By what power, or in what name, have you done this miracle?" No longer was Peter afraid of these men. Now he was filled with the courage that the Holy Spirit had given him, and he stood up boldly to speak. "If you are examining us by trial because of the miracle that has happened to this man who was born crippled, I declare to you that in the name of Jesus Christ of Nazareth, whom you crucified, whom God raised from the dead, even by him does this man stand before you healed." But Peter and John would not promise to obey them. They answered, "Whether it will be right for us to obey you rather than God, judge for yourselves; for we can not keep from telling about the wonderful things that we have seen and heard." The rulers threatened to punish them severely if they should catch them any more teaching in Jesus' name, and with such threats they let the men go free. And Peter and John returned to the company of believers, who were called disciples, to tell of all that had befallen them.